Directed by Latino Theater Company’s Fidel Gomez and originally developed with Cornerstone’s Michael John Garcés, PLACAS is a bilingual tale of fathers and sons, transformation and redemption that illuminates one man’s determination to reunite his family after surviving civil war in El Salvador, immigration, deportation, prison and street violence. Inspired by the real-life experiences of ex-gang member Alex Sanchez, Culture Clash’s Ric Salinas stars in the story of a Salvadoran immigrant who tries to reclaim his family while letting go of his gangbanger past. 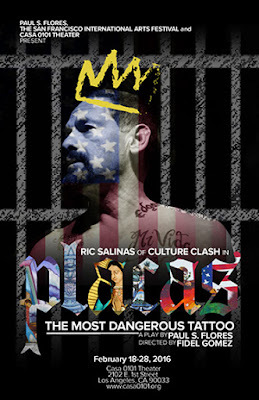 PLACAS: The Most Dangerous Tattoo by 2015 Doris Duke Artist Award-winner and celebrated spoken word artist Paul S. Flores gets a limited two-week run at Casa 0101 in Boyle Heights from February 18 through February 28. As part of the writing process, Flores interviewed over 100 gang members, parents and intervention workers in the Bay Area, Los Angeles and El Salvador. The character of Fausto Carbajal (Salinas) is loosely based on the experiences of former gang member Sanchez, now an internationally recognized violence prevention pioneer, expert on gang culture and youth criminalization, and co-founder of Homies Unidos in Los Angeles.